Look at the best teams in the country and you'll find a common theme among them. They all have depth, loads of it. But consider what the No. 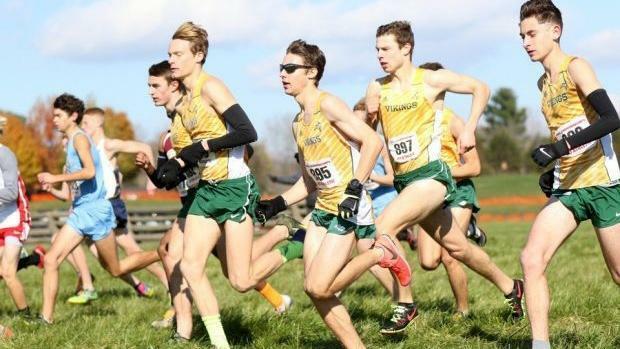 1 Loudoun Valley (VA) High School boys team accomplished in the weeks leading into the Nike Cross Nationals Southeast championship race on November 24, and then compare it to their lead-up to Nike Cross Nationals last year. There's something special brewing inside the program in Purcellville, Virginia, which is trying to become the first team in Nike Cross Nationals history to repeat as team champions and become just the second program to win its second title -- Fayetteville-Manlius, meanwhile, could do the same on Saturday. It won't take long to find that out. We'll get our answers on Saturday, December 1, in Portland, Oregon at Glendoveer Golf Course. Up until that regional date in North Carolina this November, no lineup had been exactly the same. And for a good team, sure, that's common. But for the best team in the country to have nine capable boys of scoring on the varsity lineup? You don't see that often. Square that up with the Vikings of last year, and you'll have a similar picture: A year ago, the squad sported lineup changes at Virginia's Regional meet, the VHSL Group 4A Championships, NXR Southeast and at Nike Cross Nationals. In Portland, the squad scored a record 89 points, the lowest ever for a team at NXN. Naturally, over the last two seasons, both Marc and Joan Hunter, the coaches of Loudoun Valley, learned a few things. "As coaches, we learned to follow the script from last year, trust our boys and not screw things up," Marc said. "The boys are very good at being flexible and just rolling with things as needed without freaking out," Joan added. "As the person who writes the training, I was ecstatic that most of them had a really good day at NXN. I am always looking for the patterns that lead to success, and sometimes it is hard to figure out what worked and what didn't, but overall, I felt like our training over the season went pretty well." 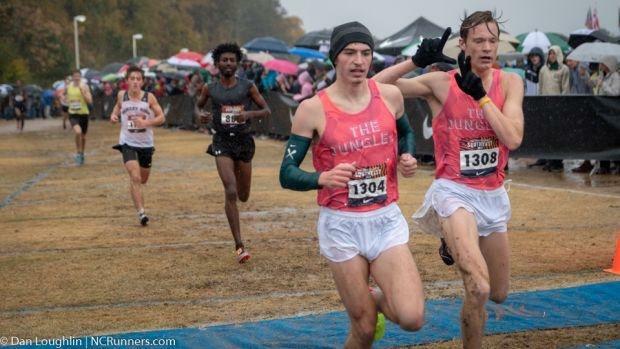 Following the team's historic win at Nike Cross Nationals in 2017, where 'The Jungle' scored a record 89 points, Loudoun Valley was hit with some obvious losses. The graduations of Peter Morris and Colton Bogucki left the Vikings a little exposed to the cyclical nature of high school running. But in came the transfers of Mateo Barreto, formerly of Kettle Run (VA), and Carlos Shultz, formerly of Phoenixville Area High School (PA). Both scored within the top 25 of their state meets last year, with Barreto even going top 10 in Group 4A. Those additions are just one extension of the vine that has supplied the Vikings, though. In the year since, senior Jacob Hunter has become a fantastic runner, the type of athlete who would be a No. 1 on any other team. Senior Connor Wells, a Duke signee, continued his late-season ascent, and senior Samuel Affolder, a University of Washington recruit, retained and welcomed his role as the team's No. 1 runner -- even though he's run in just five races this season. Lest we forget about the crucial members of the lineup beyond the front runners. Senior Jacob Windle has bounced up and down the lineup for much of the season, but he's also the kind of athlete who's necessary for any great team: The No. 5 or 6 or 7 pulling the score up from the bootstraps. He was 10th at state and 24th at NXR Southeast. Junior Kellen Hasle, meanwhile, might be sneaky good in the future, too. He was 17th at NXR Southeast and third at state. This doesn't even go into Loudoun Valley's 'B' team, which could have competed with some of the best teams in NXR Southeast's Championship Race. But how did it all start? How did this mercurial rise happen so suddenly? "To resurrect a broken program, we were given and blessed with two things: a superstar and a good first freshman class of athletes and families," Marc said of his son, Drew, and the team he and his wife welcomed that first year. "Drew Hunter was the superstar and he made running cool at our school and an option sport for those kids that were burned out on other sports. That first year (2014) we officially took over the program, [but] we were given such a high character group of kids as well. That group, or at least three of them, was the cornerstone of our national championship team four years later." It's pretty simple. Success at the highest level breeds dedication by those within the program. But transfers certainly help, too. Affolder came to town a couple years later after Drew graduated -- Affolder's father, who works within the military, moved the family to Virginia from Carlisle, Pennsylvania. That brought in exceptional talent. And yet, when it comes down to the basics, Loudoun Valley gets it right, too. Joan's been the driving force behind the team's training since 2014. "I spend a ton of time thinking about training, probably too much time," she said. "It's where my mind goes when not occupied by something else!" Joan said she used last year's plan to build up this year's squad, and her approach often has centered around an unusual approach. She knows what the team will start with and end with, but the middle portion of her training plan is what gets the most adjustment -- tweaks here or there based on the week. She'll take advantage of weather conditions, or race venues, and she might change up a plan last minute to utilize a resource at a venue. "I don't really think in terms of macrocycles and microcycles," she said, "I think more in terms of patterns of workouts, what kinds of workouts I like to see present over certain time period. I guess that could be considered a microcycle of training, but I don't have a set number of days as long as all the elements are present every 7-10 days or so." This coaching partnership works for a lot of reasons, too, the first being that Joan and Marc are married and cooperative and supportive. "We definitely would have a hard time coaching without each other," Marc said. "It's a great advantage to have a husband-wife team that agree on almost everything involved with running a successful highi school track and field and cross country program." But the second revolves around the roles each play. Marc, a planner by nature, does the little things that might go overlooked, and calls himself "the manager." He works with the younger kids, helps injured athletes get back to health and does a lot of "behind the scenes stuff" that fellow coaches might understand. Talking with parents, for one. He's also the big-picture, strategic idealist. Joan, meanwhile, works on her instincts, and knows when to change things up and when to keep them consistent. "I am pretty good at adapting things to whatever is thrown at us," she said," whether it is needing to modify a workout or the structure of a practice, so maybe that is what Marc means by 'flying by the seat of my pants.'" I also think our parenting skills come in handy coaching." Success has come with consistency. The Hunter's have been key in driving that point home. One big contention point has been volume. The boys team runs six to seven times a week, and most of the top group goes seven outside of an illness or fatigue. Joan believes if you find the right mileage, running seven days a week actually presents more of a benefit in terms of injury prevention. The team doesn't execute "a lot of hard workouts," and the Hunter's are sticklers for rest days. They advocate for nine hours of sleep per night and stress eating right and utilizing resources when athletes are sore -- Epsom salt, chiropractor, dry needling. So when it comes time for a meet day? All that work has been tirelessly posted and checked off. And ery little has been said about the expectations on the team this year, though the Vikings do realize they've been ranked No. 1 in the country for the entire year. "The boys self-regulate and are somewhat on auto-pilot at this point of the year," Marc said. "As far as impact, or "rubbing off," I think winning the national championship last year has made all our lives better, but it comes with the additional expectations, and if we hadnle that with the same poise we did last year, we will be very successful."